For no more than $600, you could get yourself a round-trip ticket from Montréal to Paris. On such a flight, by about the time you fold down your tray table for the rubber chicken, you'd be soaring over a tiny archipelago in the Gulf of St. Lawrence. But unfortunately, if this is where you wanted to land, the flight would have cost you nearly twice as much. 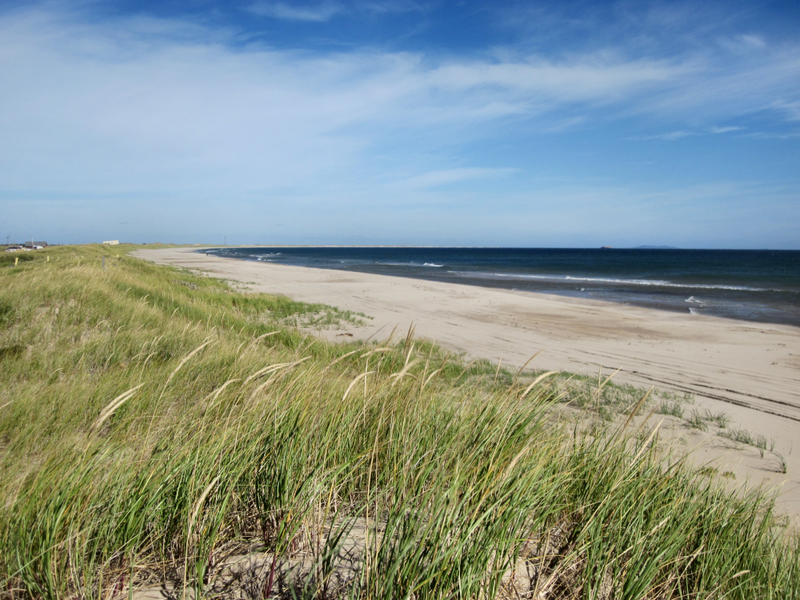 The islands in question are the Iles de la Madeleine, a cluster of 7 sandy shoals located half-way between Prince Edward Island and Cape Breton, inhabited by 13'000 Acadians and a handful of anglophone descendants of shipwrecked sailors. Despite their remote location, the islands are politically part of Québec. And that held the key for us to get there cheaply: The 3-stop flights that link them with Montréal are considered "intra-province" and as such available for only a handful of frequent flyer miles. And so we clambered aboard an ancient Dash 8 aircraft one sunny fall morning, and soon found ourselves on approach over the sandy dunes. Sand, indeed, is not in short supply: Over 300km of unspoilt beachline meant that we didn't need to leave our cozy Bed & Breakfast early to put down our blankets at the best spot. Not that they would have stayed there for long anyways: The constant wind, which makes the archipelago a mecca for surfers and kite-flyers, would have swiftly swept them away. Our visit was at the very end of the short summer season, meaning that many attractions and dining choices had already closed for the year and the weather had gotten too cool for any water sports. Rather than hoards of German tourists, it was seals and migrating birds that kept us company on our long walks along the water, and up onto the crumbly red sandstone cliffs that mark parts of the shore. Low tide reveals grottos and caves under these cliffs, and it was there that the most magical of events took place one full moon night: As part of the Contes en Iles festival, torches and bonfires were set up, and storytellers from the near and far set out to spin their yarn in their light. The locals were clearly entranced, and we were enchanted, if by nothing else than the colorful local accent, so different from the grande terre, as they call the mainland. Which, as it happens, is just as expensive to get to for the madelinots as it is the other way round. While this leads to high prices for goods that need to be ferried in (i.e. everything), it also fosters a close-knit, trusting and welcoming attitude: Houses and cars were routinely left unlocked. At our second visit to the local bistro, the staff started gossiping with us. At the farmer's market, villagers loaded their own baskets with produce and paid in a honor system. This, I thought, must be what rural life had been like everywhere in centuries past. Of course, recent times have brought some changes (for instance mobile phones in 2003, as the tourist guide proudly proclaimed), including the micro-breweries, cheesemakers, and crafts shops that holidaying urbanites look for in their quest for authenticity. A recent surge in visitor arrivals, albeit still very reasonable, rewards the locals' initiatives. It is not hard to see how word spreads about these mystical islands with their charming inhabitants. The highlight of our tale about the Hawaii of Québec however isn't its delicious food, or its unique madelinot accent, or even the adventurous way to get there. It is the otherworldly beauty and rough charm of a landscape so different that it has to be seen to be believed.